IMAO Keinen was a Kyoto school painter, a student of SUZUKI Hyakunen and contemporary of SUZUKI Shônen (whose screen painting 'Pine trees' is in the gallery collection). He was particularly excelled in naturalistic depictions of birds and flowers, and won many awards at domestic and international exhibitions. He also painted for the Imperial household. IMAO published a few picture albums in woodblock prints. 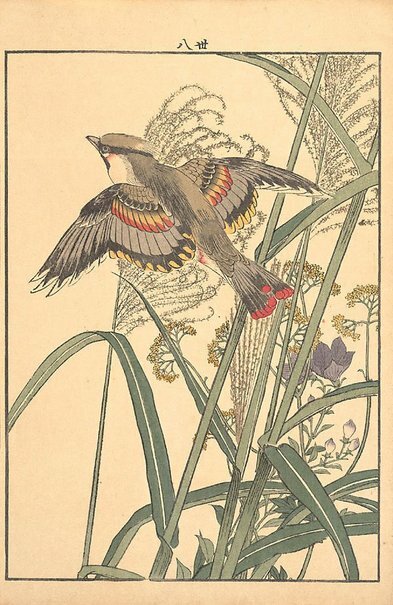 One is titled [Keinen's picture album of birds and flowers] published in four volumes in 1891. These four leaves (Acc.no.s 63.2002.1-4) may have come from this publication.